On a sunny morning as I entered a village school in a district south of Punjab, I saw a little boy standing alone next to a tree, away from the crowd of children playing in the ground. Passing by him I went in to meet the Para teacher and the Head teacher for filling assessment forms for the ‘Chalo Barho Camp’ at the school. When I got done with it I approached this boy, Ghulam Yaseen, who stood there shy and scared. Ghulam Yaseen’s spirited and bright eyes showed how enthusiastic a student he would be however his burnt hands told a different story. Ghulam Yaseen is one of those millions of children who have been deprived from their right to education due to child labor. Due to financial crisis Ghulam Yaseen’s parents decided to pull their son out of school who was already enrolled in the third grade and sent him off to find work. Ghulam Yaseen ended up in a brick kiln where laborers have been working in the most hazardous conditions with precarious effects on health such as heat strokes, skin burn, lung problems etc. As of January 2016 Labor Department statistics, there are 23,642 childern below the age of 14 working in brick kilns. Brick kilns are just a small fragment of the whole picture; the number shoots up to 12 million as quoted by the International Labor Organization of children involved in child labor in Pakistan. Fortunately, Ghulam Yaseen did not end up in the kiln for a long time. One of our Para Teachers from Idara-e- Taleem-o- Agahi found him and convinced his family to enroll him back into the school after series of counseling sessions. He started off with the ‘Chalo Parho Barho’ (CPB) camp which primarily focuses on Out of School Childern and helps them to mainstream in regular school education after assessing their learning levels over a period of time. 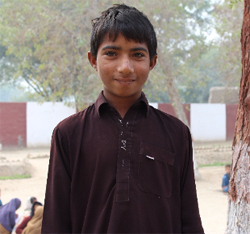 Ghulam Yaseen stood out in the CPB camp and after one year gap was enrolled back in the third grade. During this time Ghulam Yaseen catched up on his education where he can now not only read and write sentences in Urdu and English but also multiply upto two digit numbers. As Ghulam himself puts it “I enjoy coming to school and I never want to quit it” reflects on the aspirations of millions of those children who have been in the disadvantaged fringes of society. To play its part, Idara-e- Taleem-o- Agahi’s program is working primarily on community outreach where it provides physical rehabilitation and mainstreaming of children, provision of learning materials to teachers, enrichment activities and basic infrastructural support to schools. The organization has amalgamated its resources with Dubai Cares to promote education as a comprehensive process for human and social transformation. However a lot many milestones are yet to be achieved along the journey of educational reform so that cases such as that of Ghulam Yaseen become an anomaly in Pakistan.